Cut a 600g pumpkin into 6 slices and remove the seeds. Mix the seeds with ½ teaspoon chilli flakes, ½ teaspoon salt, some pepper and a tablespoon of lime juice and another tablespoon of lime zest. Roast the seeds in the oven for 30-40 minutes, until crunchy and golden brown, tossing halfway through cooking. Next, place the pumpkin slices in a roasting tin. Mix together 2 tablespoons walnut oil, 2 tablespoons runny honey and the leaves from 6 sprigs of fresh thyme. Pour this liquid over the pumpkin slices and ensure they are all coated. Sprinkle half a teaspoon each of chilli flakes and paprika over the pumpkin slices, season with salt and black pepper and cover with foil. Turn the oven up to 190°C. Roast the pumpkin for 30 minutes, and then remove the foil and roast for a further 20 minutes, basting regularly until the sauce and the wedges have caramelised. 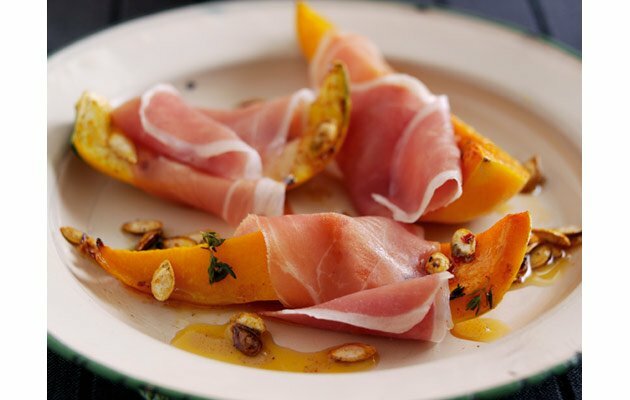 Squeeze some lime juice over the pumpkin and wrap a slice of Parma Ham around each one. Serve with the pumpkin seeds.